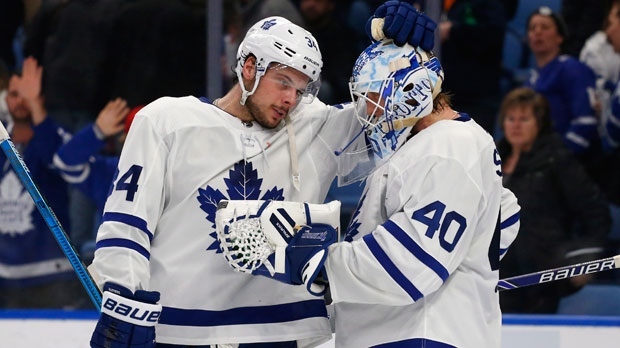 BUFFALO, N.Y. -- John Tavares and Auston Matthews each had a goal and assist, and the Toronto Maple Leafs won for just the second time in six games, beating the Buffalo Sabres 4-2 on Wednesday night. Casey Mittelstadt and Alexander Nylander scored for Buffalo, which dropped to 1-7-1 in its past eight. Coming off a 4-3 shootout win over St. Louis on Sunday, the Sabres have gone 41 games since winning consecutive outings. It's a stretch dating to Dec. 11-13, during which Buffalo dropped to 12-24-5. Tavares then set up Marner's goal 22 seconds into the third period with a no-look backhand pass from the left boards. Marner was untouched in driving to the slot, where he snapped a shot under goalie Carter Hutton's blocker. Buffalo's Nylander -- younger brother of Toronto's Alexander Nylander -- cut Toronto's lead to 3-2 with 14:23 left when he one-timed in Vladimir Sobotka's centring pass into the slot. Coach Mike Babcock, on Wednesday, agreed with the notion that Sparks' comments might place more pressure on the backup goalie. Rasmus Dahlin's assist on Mittelstadt's goal upped the rookie's total to 38 points and moved him ahead of Bobby Orr for second-most by an NHL defenceman before his 19th birthday. The only player ahead of him is Housley, who had 57 points as an 18-year-old with Buffalo in 1982-83. NOTES: Toronto swept the four-game season series over Buffalo and improved to 22-11-4 on the road -- one win shy of matching the franchise record set in 2003-04. ... The Sabres assigned prospect forward Matej Pekar to AHL Rochester after the 19-year-old completed his season with Barrie of the Ontario Hockey League. It's unclear when Pekar will play, as the 2018 fourth-round draft pick has been out since breaking his collarbone in January. ... With San Jose clinching a playoff spot, the Sabres officially acquired the Sharks' first-round pick in this year's draft. The Sharks had the option of retaining the pick -- acquired in a trade for Evander Kane -- if they missed the playoffs this year and send Buffalo their 2020 first-round selection.